Remove Adobe's Stealth Chrome Extension - Ask Leo! An Adobe Acrobat update is installing more than just an update. 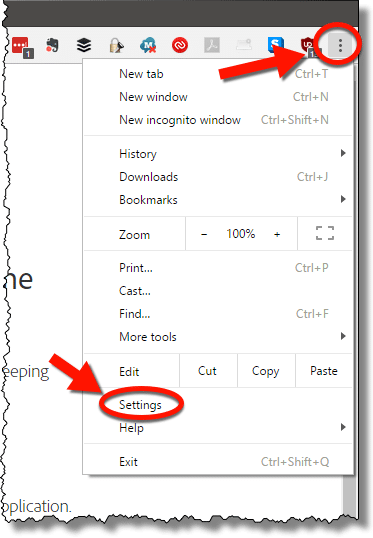 If you have Adobe Reader installed to read PDF files, and you use Chrome, you may find that you got a little something extra you didn’t ask for in a recent update. I’m not going to call this a PUP, but to be honest, I can see how many people might believe it to be. It’s something you didn’t ask for and probably don’t need, installed without being asked. That’s pretty close to the definition of a PUP, if you ask me. The first sign was the orange exclamation mark in Chrome where the Settings menu ellipsis usually sits. Clicking on it revealed the cause for the alert. “New extension added (Adobe Acrobat)” displayed because the Adobe updater had just run and updated Acrobat. In addition to the update, it installed the Chrome extension. Clicking on that alert displayed additional information. Fortunately, Chrome had not activated the extension. 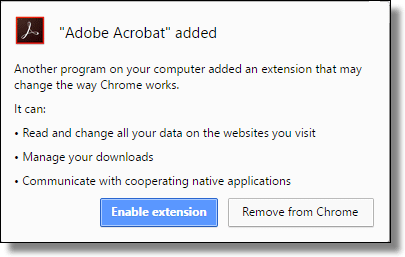 My recommendation: click on Remove from Chrome to remove the unasked-for extension (for reasons I address shortly). If you happened to move on without removing the extension, or accepted the extension and enabled it, you can always remove it later. Click on the settings (ellipsis) menu in the upper right, and then click on Settings. On the left, click on Extensions. 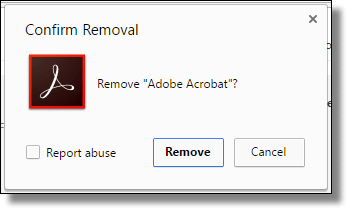 On the resulting page, look for the listing for Adobe Acrobat, and click on the garbage can icon to its right to remove it. You’ll be given a prompt to confirm. You have the option to report abuse when you remove it. It’s up to you whether or not you want to. I did, citing that the extension was installed without my permission. Click Remove to remove the extension. Of course, we’re curious – just what does this surprise extension do? Note that some features may only be available on Windows with Acrobat XI or Acrobat DC installed. Whether or not you find these features to be valuable, it’s important to note that anonymous usage information is shared with Adobe by default. That, all by itself, is a serious breach of trust for many. « Previous post: How do I Copy Photos from My Phone to My PC? I’ve been using Sumatra for years instead of Adobe Reader/Acrobat. Sure…Sumatra is not as robust as Adobe Reader/Acrobat. But if all you need is a program to open and read pdf’s, Sumatra has been great. Dependable, simple, and very lightweight with no bloat. There’s even a portable version. I thought I got an Adobe update a few days ago but I don’t see the extension in my Chrome. I had chrome installing itself on my computer so I uninstalled it and it came back on again. I always uninstall chrome because once I did use it and when I would run Malwarebytes it would show seven up to ten pups that were put on there by chrome which I would uninstall. needless to say I do not recommend chrome to anyone. I occasionally use the portable version of Chrome (obtained from Portable Apps) and have not had the problem you describe. But I don’t know if that’s because it’s the portable version, or some other difference between my rig and yours. In any event, my primary browser is Firefox. Chrome does not automagically silently install and nor does it install PUPs. I can only assume that you inadvertently installed Chrome along with some other application with which it had been bundled. I have to disagree with you on the statement that Chrome does not “Automagically” install itself or other PUPs. It is in itself a PUP and does install itself without any confirmation. It is also a huge pain to remove once it has got into ones system. No Uninstall, either in Windows programs or in its own menus. Very un-business like activitys by the company involved in marketing. I use Chrome a lot and recommend it. But make certain you only download it from the official site. Anywhere else and you run the risk of getting PUPs as you have experienced. You should never let Adobe PDF reader updates install automatically. Choose the Notify me option and keep choosing it, because it will come back set to the automatic option every time. As for Chrome, UNCHECK all Google options and you won’t have that happen, they are defaulted in the installation process. While the PDF reader is desirable they seem to have a deal with Google…that is why the download is free I suppose. But don’t allow automatic updating. Adobe has been trying to get you to install antivirus software with updates for a long time. This just ups the slime level. I’m not sure this is black and white as some people are suggesting. It sounds like these are additional features to Adobe Acrobat/Adobe Reader which you did give permission to install on your computer. How is this any different than when I installed VLC media player on my computer and it automatically added an Add-on in Firefox? I just manage my Add-ons and can choose to enable it or disable it. Leo has made his choice to disable the Adobe add-on. What bothers me is that the add-on WILL collect anonymous data and send to Adobe. Thanks for keeping it anonymous, but people should have the option to disable data sharing completely, if they want to use the add-on but not participate in the usage data program. Anonymous data collection is often the ‘price’ of ‘free’ programs. You do have the option to disable data sharing completely. Uninstall the program and find something else. Not trying to be flip. There are other, less intrusive options. Google chrome, downloaded directly from Google, didn’t install PUPs. I use both Firefox and Chrome. Still don’t care much for Chrome, but have gotten used to it. Thank-you Leo! WinPatrol warned me that was about to happen. I refused it. Interesting! As I use a Microsoft OS I won’t use Bing, reasoning that MS probably know more than enough about me anyway. So I use Google (and Copernic) for search. And therefore instinctively I don’t use Chrome as my main browser (though I do have it installed – can’t think why, now). I use Firefox. I’ll keep a look out for any attempt by Adobe Reader to nobble Firefox – thanks for the heads up, Leo! “Midwest Guy” recommended a free pdf reader called Sumatra. Not familiar but I visited their web page. Probably just fine. My experience has been with Foxit Reader https://www.foxitsoftware.com/products/pdf-reader/. Visit that page and you’ll see Foxit does a lot more than display pdfs. My favorite feature is a print options can creates a pdf from any document, inc web pages. (maybe they all that that). I’ve never experienced sneaky PUPs or other annoyances. Worthy alternative, lightweights, etc. Sumatra is a well known .pdf reader which I’ve used myself previously, so it should probably be OK to use. Just to be safe, I’d be sure to use custom installation to be sure it didn’t install any unwanted extras as is the case with a lot of free software nowadays. I’ve been using Foxit for a long time, but latelly, it started trying shoving it’s PDFdirect down my throat. Uninstalled and now using Sumatra. Works well for me. I use this extension from Adobe for years and it is very valuable for my work. It supposedly send usage info back to Adobe for improvement purposes, likewise a lot of applications do. No biggie. I actually need this extension. 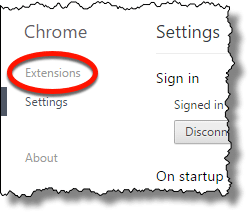 how do you permanently remove the extension so it doesn’t even prompt me when i reinstall chrome? i know i’m lazy to google but chrome provides a method for external extension to sneak in and adobe is using this method.